Smallpox Virus Found In Unsecured NIH Lab : Shots - Health News Sure, we all forget stuff. But federal researchers apparently forgot vials of smallpox virus, perhaps for 60 years. The vials were rushed to a secure lab in Atlanta. 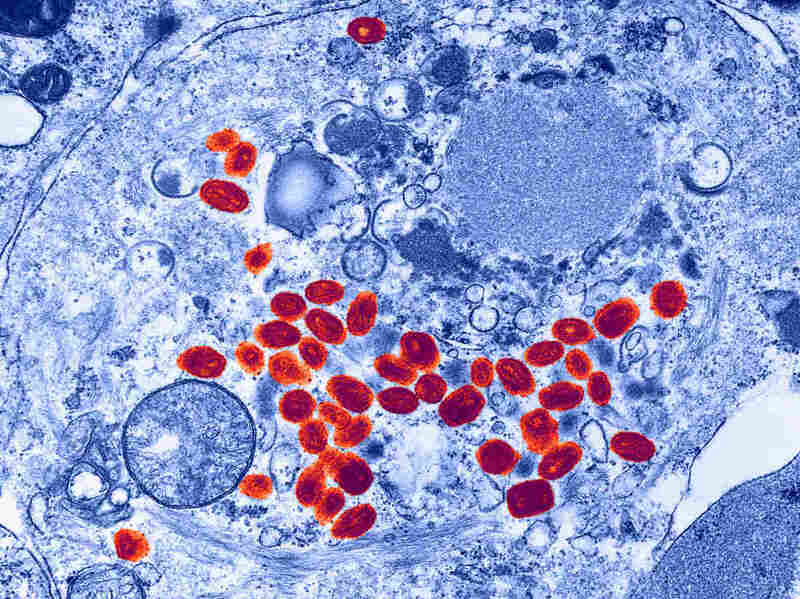 Not something you'd want to find: Smallpox viruses infect a cell. Scientists cleaning out an old laboratory on the National Institutes of Health campus in Bethesda, Md., last week came across a startling discovery: vials labeled "variola" — in other words, smallpox. Under international convention, there are supposed to be only two stashes of this deadly virus: one at the federal Centers for Disease Control and Prevention in Atlanta, and another at a similar facility in Russia. The CDC swooped in to collect the vials and carted them off to a secure lab at its Atlanta headquarters. In a statement Tuesday, the agency said scientists did indeed find smallpox DNA in the vials. Scientists are now testing the sample to see whether any of the smallpox virus is still capable of causing disease. That testing will take two weeks. "There is no evidence that any of the vials labeled variola has been breached," the CDC said in the statement, "and onsite biosafety personnel have not identified any infectious exposure risk to lab workers or the public." Deadly agents like smallpox are supposed to be contained in high-security laboratories. The lab on the NIH campus did not meet those standards. In May, the World Health Organization declined to order destruction of the world's remaining stocks of smallpox virus. "Smallpox was clearly the most serious infectious disease that mankind has endured over history," Dr. D.A. Henderson, who led the international effort that eradicated smallpox in 1977, told NPR's Rob Stein. Henderson thinks the virus should be destroyed, but researchers at the CDC disagree. The CDC and the FBI are investigating the history of these vials, which apparently date to the 1950s, according to the CDC statement.